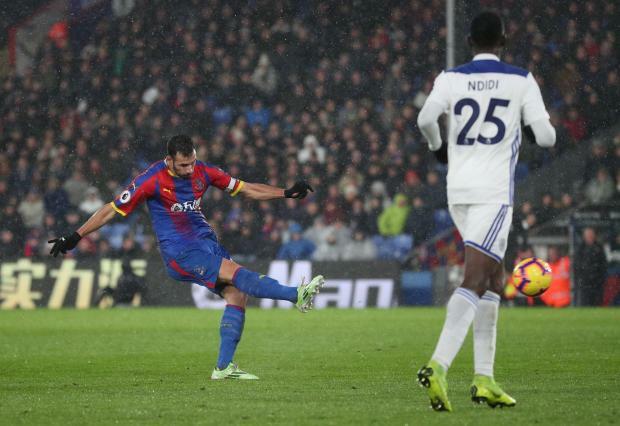 Crystal Palace's Luka Milivojevic scores their first goal. Crystal Palace moved five points clear of the bottom three in the Premier League when Luka Milivojevic scored to give the south London club a 1-0 win over Leicester City on Saturday. Roy Hodgson's side had suffered a nightmare spell in the top flight, winning just one of their previous 11 Premier League games, but they broke the Wilfried Zaha curse by triumphing for the first time in 14 games without their influential forward. Leicester had the ball in the Palace net after 27 minutes but Jamie Vardy's effort was disallowed. The former England striker made the most of a poor touch from Crystal Palace goalkeeper Vicente Guaita on his Premier League debut and slotted the ball into the back of the net but he was adjudged to have fouled the keeper.